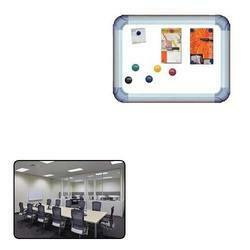 Offering you a complete choice of products which include rc magnetic white board for offices. Board Size 17" x 23"
Being a client-centric organization, we are engaged in manufacturing, supplying and trading a wide array of RC Magnetic White Board for Offices. For various places such as educational institutes, corporate sectors, hospitals, hotels and malls, these boards are widely demanded. Manufactured in adherence with the industry set guidelines, we aim to attain highest benchmarks of quality. Looking for RC Magnetic White Board for Offices ?